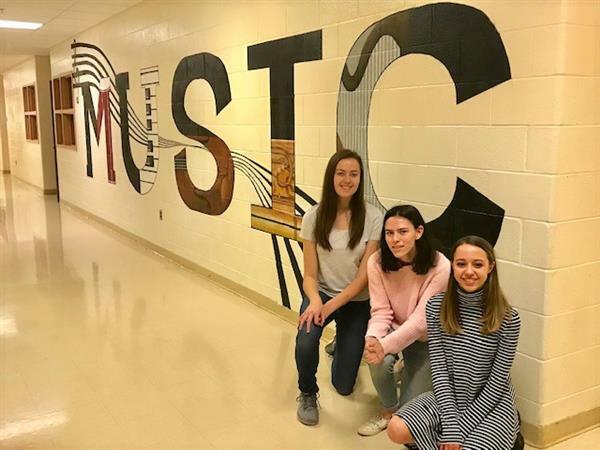 Pictured with the mural they created in the music wing of Oxford Area High School are seniors, from left, Hannah Bartlett, Emily Stewart and Gina Pilaitis. Since last spring, the hallway of Oxford Area High School that houses the instrumental and vocal music education classrooms and practice spaces, affectionately known as the "West Wing," has sported a design as lively as the sounds that can be heard in those rooms every day. A mural dedicated to the spirit of music was painted in the west wing by seniors Hannah Bartlett, Emily Stewart and Gina Pilaitis. Gina designed and coordinated the mural painting as her graduation project. The mural was completed after two years of planning and execution by the three students. Once a week, they would stay after school and work on the mural for one-and-half to two hours. “They were able to sketch and design a scale model of the mural for approval, then spent many hours working on it,” said Mrs. Hill. "They are so talented!" The mural covers nearly all of the long hallway of the west wing, with large letters spelling out MUSIC over a flowing scale. Depicted within each letter are the instruments used by the high school musicians. Gina saw the mural as a natural graduation project, and will continue her artistic endeavors after high school, when she to plans to study fine arts and is hoping to attend New York University.